The First Quarter, the women: Serena snaps an A+, but Aga was at a D. Who else and why? She won everything except when she was hurt, she came back to Indian Wells when she didn’t have to ever again but she did anyway, and now, she is so steady and smart that she doesn’t even have to dominate her first serves and she still win. Wow. Yes, Halep froze in Australia, but outside of that she has been so consistent and never backs off. She won Dubai and Indian Wells and came very close to beat Serena in Miami. If she continues to believe in herself, she will win a Slam this year. While the Spaniard did not win a tournament this year, since February she has gone deep everywhere. In Miami she upended Radwanska and Venus Williams in two tremendous three setters. Yes she was scared against Serena in the final, but the smaller Carla moves forward all the time now. The veteran Maria started off the year with a bang, winning Brisbane, reaching the Aussie final where this time she was close against Serena and she looked tremendous in Fed Cup to beat Poland. While she did not play at Indian Wells or Miami, she was almost perfect in Australia. The German was out of it until Indian Wells and Miami, and then she appeared again and looked much better, snaring wins over Errani, Garcia, Pennetta and Ivanovic. She was close against Serena when she fell in three sets. She is crushing the ball – inside the court. The young Spaniard has been very good for the most part, but as powerful as she is, she can become wild. However, she did win both matches at Fed Cup in Romania and beating Halep there, which is good enough. Clearly Keys put together a tremendous tournament at the Australian Open, reaching the semis by beating Kvitova and Venus before losing to Serena. 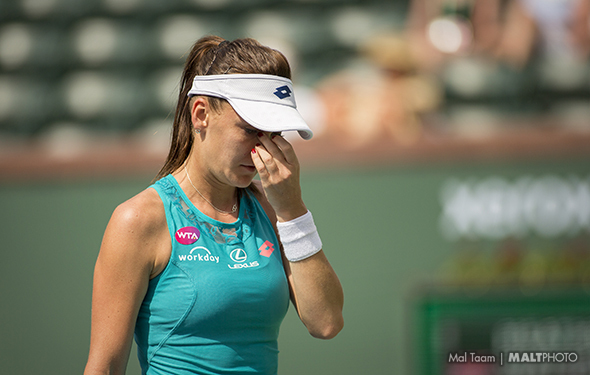 However, she has been hurt and is now struggling, and did not play well in Indian Wells or Miami. But when you are 20 years old and reach a Slam semi, you earn it at least a B. Speaking of which, the Russian reached the Aussie semifinal, which was eye-popping. Beyond that though she has not played her singles very well at all, but her doubles has been excellent overall. Every week, the younger Czech was about to rise and grab a big tournament, because she has one of the biggest serves out there and can also crush her forehands and backhands. However, she is not quite there yet mentally, but she’s close. It was nice to see the veteran winning a big tourney by grabbing Doha. She may not ever reach the top 10, but she will continue to try as had as she can before she retires. The famous “JJ” was nowhere and then all of a sudden she rose and reached the Indian Wells final. She then fell apart quickly in Miami, but at least she seems enthusiastic again. She did nothing in January, but she won two marathons at Fed Cup against Australia, she won Antwerp and reached the semifinal at Miami. She loves the media and is well liked with the players, but she can lose her temper on court. Here is the reality for Venus: she is intelligent and always tries, but she is 34 years old and she is not as fast as she used to be. Yes, she can reach into the quarters and semis at the big tournaments, but against the better players (this year she has lost to Keys, Safarova, Azarenka and Suarez) she will continue to struggle. Good, but not great. The Czech looked terrific by winning Sydney, but she folded after that, largely because she has been injured or ill once again. That’s too bad because if she can’t stay healthy there is no way that she will ever be able to reach No. 1. OK Errani won Rio, which is fine, but she didn’t have to face anyone in the top 65. She did beat Muguruza, but that is it. She looked great after reaching the final in Brisbane and she was ready to rock again, but she has done almost nothing since then and appears shaky. She is a great person, but she has to calm down on court. If Bouchard hasn’t reached to the quarterfinals at the Aussie Open, she would have totally bombed. She looks very nervous and she is all over the place. Genie doesn’t have all the tools yet, but she’s very close – if she listens to her coach. “Caro” did very little after reaching the Auckland finals, losing to Vika Azarenka twice and falling fast at Indian Wells and Miami. OK she won Malaysia, but she didn’t have to beat anyone in the top-80. Where does she go from here? Nobody knows. This is the toughest and worst three months ever. She is so good, but apparently she is changing her tactics and/or her strokes, so she hasn’t looked confident at all. She is intelligent and can mix it up, but she is not sure when and where she is going. Maybe soon, but she didn’t show up at any tournament during the last three months. She is better than this. The lefty German looked OK but not fantastic during Brisbane and Sydney, but then she plunged. She has been absolutely wild, which is surprising given that she used to be super steady. It’s all about where her head is.